There are a great many injustices embedded in the faith school sector of our education system. And as the Government moves to drastically increase the extent of religious discrimination and segregation in our schools, these injustices are only becoming further entrenched. But which injustice is the worst? In a system that allows schools to discriminate against children on the basis of their parents’ religious or non-religious beliefs, forces countless parents to lie about their religion just to get their children into a local school, and requires children to compulsorily worship a god they likely don’t believe in, it can be hard to pick. In truth, however, the answer is ‘none of the above’. The greatest injustice present in our system relates to the thousands of children that we know are absent from it, and the total lack of any meaningful action to address this. 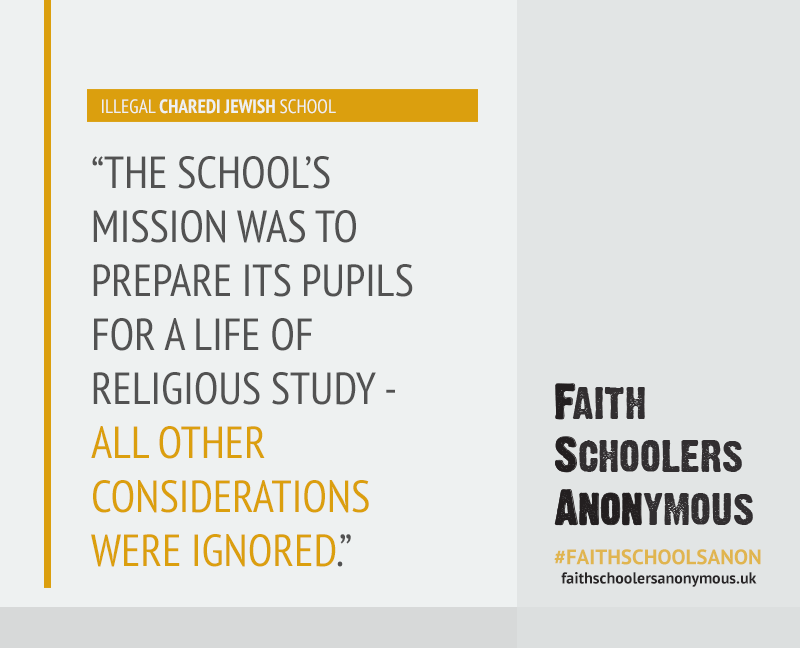 The problem of illegal religious schools in this country is one that has received increasing attention in recent years. The British Humanist Association (BHA) has been the driving force behind much of this, working with former pupils of these schools, and with government officials and journalists from the print and broadcast media, to ensure that the issue never falls too far from the top of the agenda. Not before time, the relevant authorities have started to take an interest too. Oftsed’s outgoing Chief Inspector Sir Michael Wilshaw has now written to the Education Secretary four times to outline his findings and concerns over illegal religious schools, and for the first time Ofsted have a dedicated team focused on identifying and investigating these schools. Local authorities like Hackney and Birmingham are no longer turning a blind-eye to these issues, or passing the buck when challenged on their inaction. Instead, they are carrying out their own investigations into illegal religious schools, and through the Local Government Association asking Government for more powers to intervene where they suspect children are not receiving the mainstream education they are entitled to. Even the Department for Education (DfE) has started taking some responsibility, introducing provisions to prosecute the proprietors of illegal religious schools and to clamp down on supplementary religious schools that may also be operating illegally. But for all the increased attention and concern, the perception remains that this is a problem that’s still shrouded in secrecy, hard to identify, hidden from the eyes of the authorities and the arm of the law. This perception is not correct. This is a problem well known to us. This, I hope you’ll agree, is shocking. But when the report was published last week, the only headlines it received related to the rise in the number of Jewish children attending faith schools. None of the articles covering the report mentioned the missing children or the schools not included in the DfE’s census. Again, you can see the problem here immediately. At the age of around 12/13, Jewish boys all but disappear from full time education. 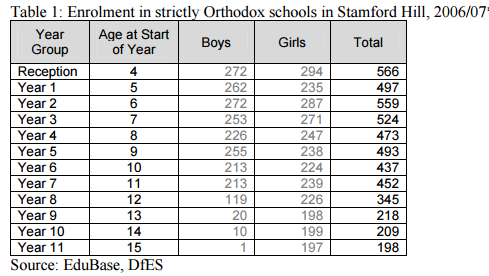 This is a public report, drawing on official data from the Department for Education, which openly and uncritically acknowledges that when boys in the strictly Orthodox community reach their early teens it is normal for them to start attending illegal, unregistered schools and for the entirety of their education from there on in to be focused exclusively on the study of scripture. 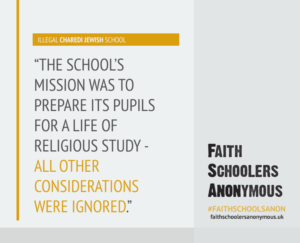 And before you begin to wonder what is wrong with this – deeply religious schools serving deeply religious communities – take some time to read about what these places are like from the former pupils who have shared their experiences on this site. We are lucky enough to live in a country and in a time in which one child going missing makes national news and provokes public outcry. And yet, when the children from almost an entire religious community go missing from the education system, year on year and by their thousands, our reaction and the reaction of our Government is to do almost nothing. That has to change.